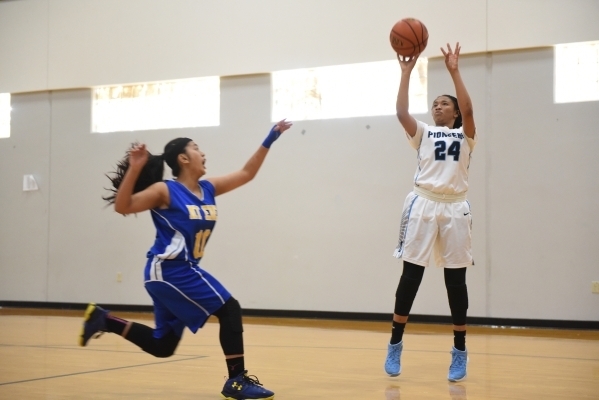 Canyon Springs’ girls basketball team has played four games decided by seven points or fewer this season. The Pioneers showed Tuesday why they’re unbeaten in those games. Aleza Bell scored the go-ahead basket with 27 seconds remaining, and Canyon Springs made all the right plays late in a come-from-behind 62-58 victory over Mt. 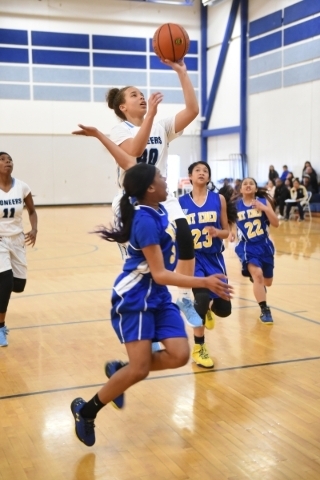 Eden (Calif.) in the quarterfinals of the Lady Wolves Holiday Tournament at Basic. The Pioneers (10-1) meet Brentwood (Calif.) in the semifinals at 8:30 a.m. today at Basic. 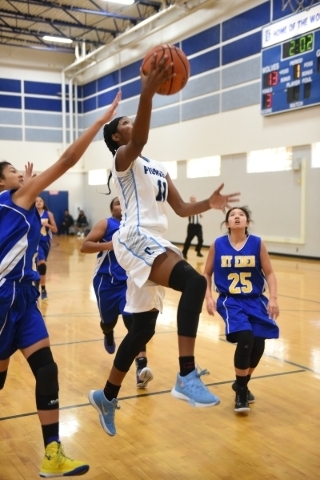 The championship game is scheduled for 1 p.m.
Dayonna Maddox led Canyon Springs with 20 points and nine rebounds, and J’hane Richardson bounced back from a blow to the face late in the first quarter to finish with 16 points. 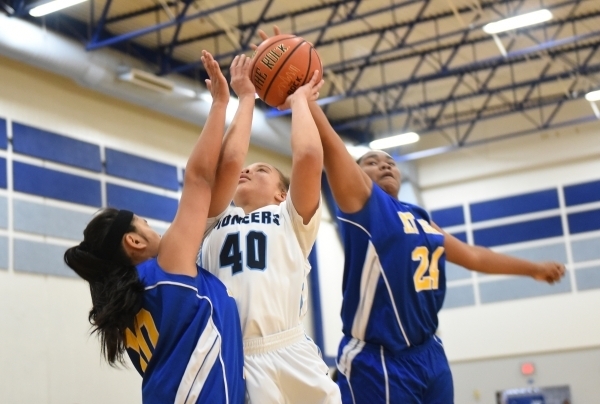 The Pioneers went more than five minutes without a field goal in the fourth quarter, and Mt. Eden used a 14-3 run to take a 58-55 lead with 1:13 remaining. Maddox followed a Canyon Springs miss and was fouled with 46.3 seconds left — she couldn’t convert the free throw — to cut the Monarchs’ lead to 58-57. After a Mt. Eden turnover, the 5-foot-1-inch Bell grabbed an offensive rebound in traffic and scored to put the Pioneers ahead for good. Canyon Springs forced another turnover on Mt. Eden’s next possession, and D’Licya Feaster went one-for-two at the foul line to give the Pioneers a 60-58 lead with 12.9 seconds remaining. KeAjanae Haley added two free throws with less than a second on the clock after the Monarchs missed a late 3-pointer. The Pioneers shot only 31.8 percent from the floor but made up for it by going 18-for-24 from the free-throw line and forcing 24 Mt. Eden turnovers. 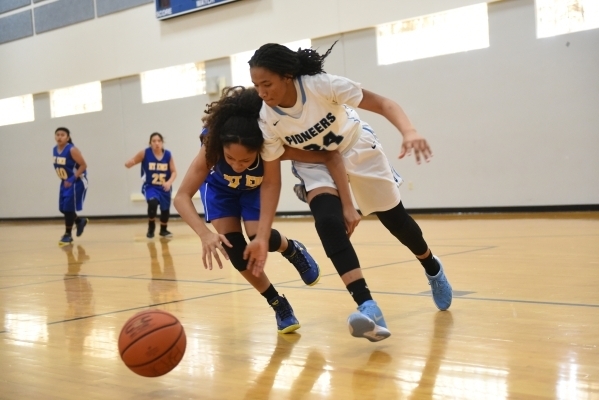 Richardson had 10 points in the first half as the Pioneers led 30-24 at halftime, and Haley scored seven of her nine points in the third quarter as Canyon Springs built an eight-point lead on three occasions. Ferrynn Steen led Mt. Eden with 19 points and went eight-for-nine from the floor. Mae’ana Alexander added 12 points and a team-high nine boards for the Monarchs, who finished one-for-14 from 3-point range. 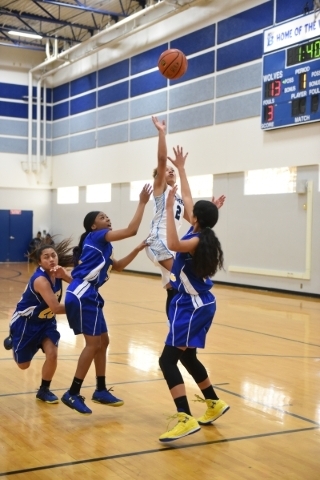 Basic 31, Wooster 17 — Amanda Sanchez scored nine points as the Wolves beat the Colts in a first-round bracket game. Tajza Eddings added seven points for Basic, which opened the game on a 14-5 run. The Wolves outscored Wooster 1-0 in the third quarter. Bailey Vollmer led the Colts with seven points. Beckman (Calif.) 45, Basic 19 — Lili Hamada, Rhiannon Do and Janessa Paredes each scored nine points to lead a balanced attack as the Patriots downed the Wolves in a quarterfinal. The Patriots made 11 3-pointers and just five 2-point baskets. 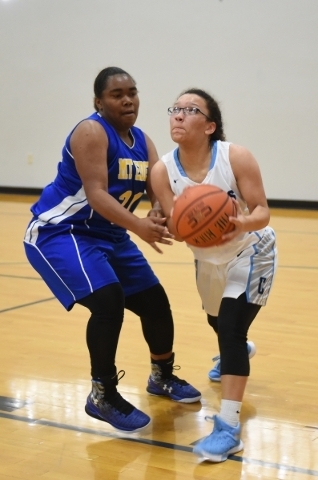 Destiny Byrd had six points, and Sanchez scored five for Basic, which trailed 27-11 at halftime and was held scoreless in the fourth quarter. Pittsburg (Calif.) 42, Legacy 40 — Adorah Buggs scored eight of her 14 points in the third quarter as the Pirates rallied by the Longhorns in a first-round bracket game. 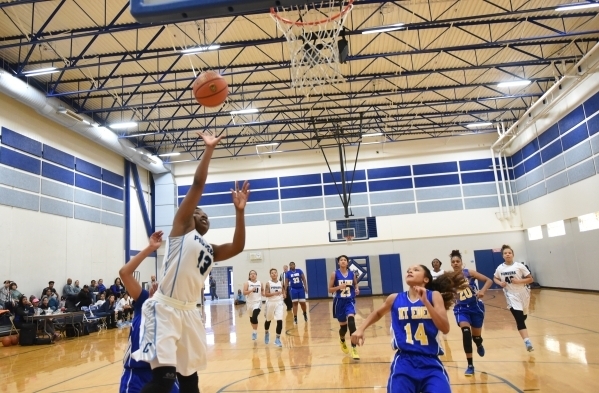 Rory Carter had 11 points, and C’Aree Stevenson added 10 points for Legacy, which led 24-17 at the half. Mt. Eden (Calif.) 53, Desert Pines 47 — Steen had 20 points as the Monarchs rallied past the Jaguars in a first-round bracket game. 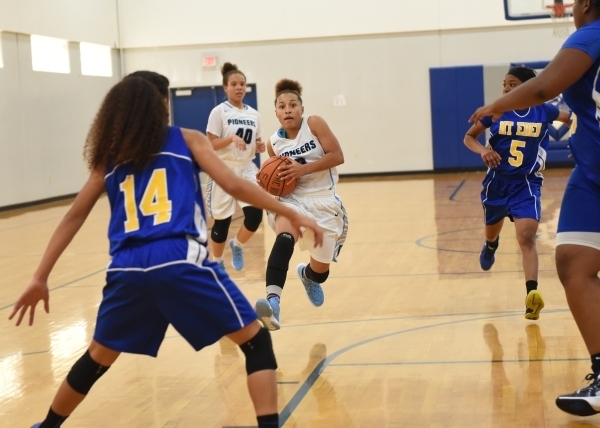 Destiny Jackson scored 11 of her 15 points in the second half for Mt. Eden, which trailed 40-39 entering the fourth quarter. 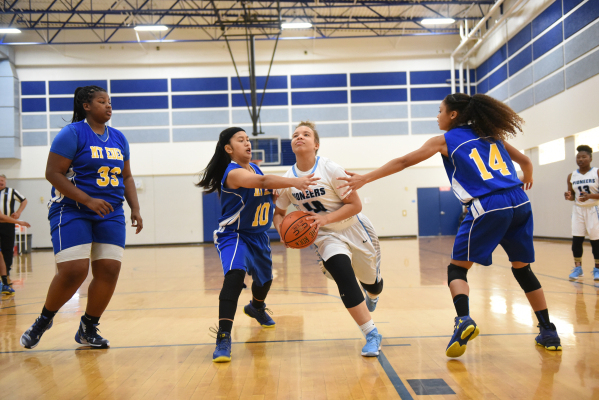 See’Airrah Evans-Collins had 13 points, and Jordan Bailey made four of Desert Pines’ five 3-pointers and finished with 12 points. Chrystian Myles added 11 points for the Jaguars. Rancho Buena Vista (Calif.) 51, Tech 27 — Lauren Buckley and Ambre Farrell each had 10 points, and the Longhorns built a 41-8 halftime lead and cruised by the Roadrunners in a first-round bracket game. Jasmine Ramos had 12 points for Tech.